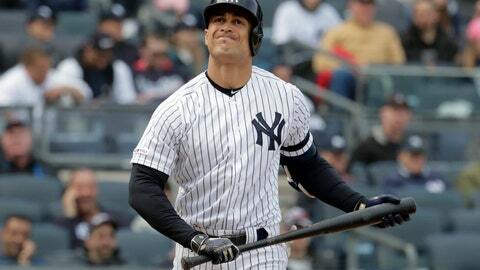 NEW YORK (AP) — Giancarlo Stanton and Miguel Andujar joined the Yankees‘ lengthy injured list, putting nearly half of New York’s starting lineup on the sidelines just three games into the season. Andujar’s injury is even more series: He sustained a small labrum tear in his right shoulder sliding headfirst into third base an inning later on a bases-loaded pickoff attempt by catcher Pedro Severino. Andujar, 24, was runner-up in AL Rookie of the Year voting last season and started the season 3 for 11. He had been scheduled for a day off, and when he didn’t take the field for batting practice and instead had treatment, the Yankees sent him for an MRI. New York’s injured list already included pitchers Luis Severino, Dellin Betances, Jordan Montgomery and Ben Heller, shortstop Didi Gregorius, center fielder Aaron Hicks and oft-injured outfielder Jacoby Ellsbury, who last played in 2017. In addition, pitcher CC Sabathia is expected to go on the injured list after completing a five-game suspension for hitting a batter with a pitch last September. Wade was angry when he was optioned to Scranton on March 24 after hitting .308 in spring training. He was at the RailRiders’ ballpark and had just showered when he got a call about 6 p.m. telling him to get to New York. He took an Uber to Yankee Stadium and arrived about two hours later after telling his driver to use a heavy foot. Notes: Sabathia remains on target to return in mid-April after striking out five over four scoreless innings in his third minor league game at the minor league complex. He is recovering from an offseason that included knee surgery on Oct. 12 and the insertion of a stent after a blockage was found in an artery from his heart on Dec. 11. Sabathia is to pitch five innings Sunday for Class A Tampa, then could start what he says will be his final major league season. … NOTES: RHP Dellin Betances (right shoulder impingement) is to throw another bullpen session Tuesday.